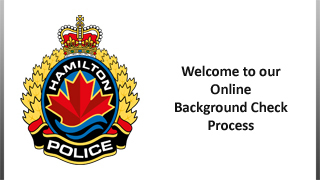 Welcome to the Hamilton Police Service's online process for persons needing a police screening check for volunteer or employment purposes. This system allows you to apply for a police screening check 24 hours a day without having to attend our facility. All aspects of the process - including verification of your identification, and fee payment - are handled electronically. If there are no concerns or follow-up required, your police screening documents will be mailed to you in a confidential envelope. Please note that we will not mail documents outside Canada. Please note: You must be a resident of the City of Hamilton (including Ancaster, Dundas, Stoney Creek, Flamborough, Binbrook and Glanbrook) in order to apply through this Police Service. Making a false statement - such as a non-resident declaring a local address at which they do not currently reside - will result in the discontinuation of application processing and the forfeiture of all monies paid. You cannot apply on behalf of another person. Authentication questions will be based on the applicant's personal credit file, and the questions are timed to ensure a prompt response and to further enhance security and privacy. This process is intended for persons living and working in Canada. If you are living/working outside Canada, you should obtain a police check from the RCMP through the submission of fingerprints. Click here for details. Please be aware of these requirements before creating an account. If you fail to authenticate your ID, you will be required to attend our offices in person with two pieces of ID. There are three levels of screening checks. The type of position you are applying for will determine which type of check you will require. In all cases you should consult with the agency, organization or employer that requires you to obtain a police check to determine which one is needed. Persons requiring a records check for the purposes of Adoption, Kinship Care or Non-Parental Custody (through court order), cannot use this online screening process. You must attend the Hamilton Police Service Records Business Centre in person to make application. The Records Business Centre is located in the Police HQ building at 155 King William Street, Hamilton. If this is the reason for your police check, you must attend our office between 10:00am and 3:00pm Monday thru Friday. The Records Business Centre is closed on civic and statutory holidays. A police record check is current as of the date it is completed. It is your employer/prospective employer or organization's function to determine if the record check is current enough to be accepted for the position applied for. The Hamilton Police Services Board, its officers, agents and employees, shall have no responsibility or obligation to make such a determination. Incomplete applications (i.e. no identification provided, authentication aborted / failed / not completed or further information requested) and applications requiring in-person attendance will remain in the processing queue for no more than sixty (60) days from the time of initial application. Fees are non-refundable and incomplete applications will be considered 'abandoned', and removed from the processing queue after sixty (60) days. The Hamilton Police Service will return the results of the check by mail to the applicant only. We will not mail the results to a third-party organization or employer under any circumstances. Intended for applicants who are involved as a volunteer, employee or in any situation where a basic CRC is requested (i.e., retail or immigration). Intended for applicants who are seeking volunteer and/or employment with agencies who require a CRC along with local police involvement. Restricted to applicants seeking employment and/or volunteering with vulnerable individuals. Please note: If you are seeking a 'Local Police Records Check' as part of the Record Suspension (Pardon) application process, do not use an online police check as it is not appropriate for this purpose.